You are currently browsing the The Pet Product Guru blog archives for the day Thursday, September 13th, 2018. 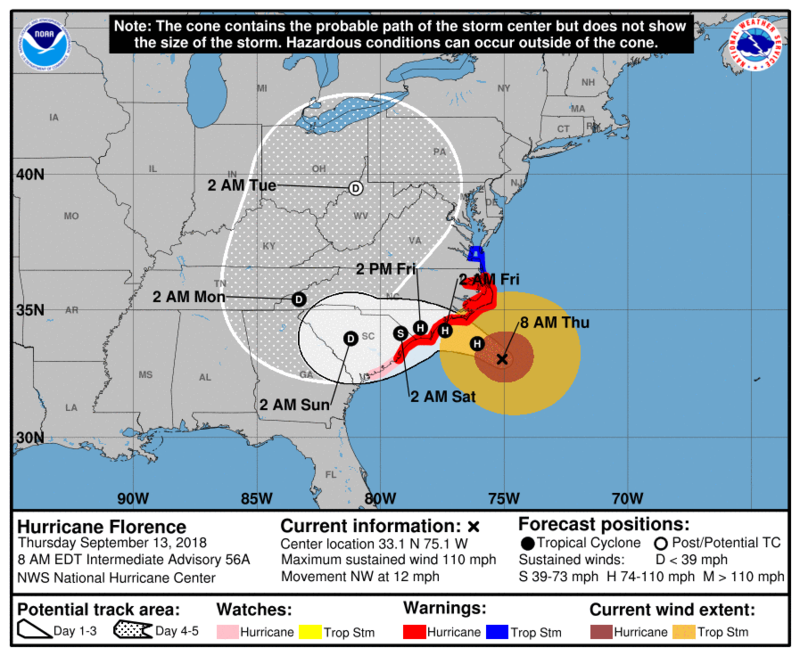 Hurricane Florence approaching the North Carolina coast. Most residents along the coast have been evacuated but there are a significant number who decided to ride out the storm. If you did, make sure that you and your pets try to stay safe. Here is some advice. The National Hurricane Center has published a comprehensive guide to ride out the storm. For years we’ve heard “Have a kit, have a plan,” but what kind of kit? Are kits really useful? And what kind of plan? What are the considerations? What should I actually DO in a hurricane?As a short answer to that last question, we put together a quick list of things you should do if a hurricane is headed your way. Keep in mind though that this is an intro list. You’ll find the link to the full article below. Reinforcement – Have you prepared your home structurally in advance, even if it’s just shutters? Equipment – Do you have all the supplies you’ll need on hand, or are you waiting for the last minute? Awareness – Do you have a way to track the storm, and do you have a way for others to track you? Cautions – Are you aware of the various risks involved in staying in place in a hurricane? Timeline – You’ll need to do a few things as the storm approaches, and timing is a factor. Some things you need to do well in advance of a major storm and some things have to wait until the last minute. 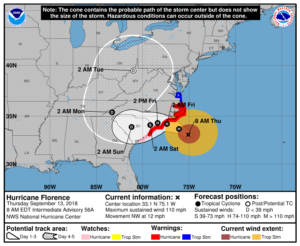 In any event, with something as large and dangerous as a hurricane, there are always details that need to be tended to and you have to consider your timing in the process. These are presented in something of a chronological order and you’ll notice these also happen to be arranged in an “outside in” order, meaning that you want to do the things that are farthest away from home first and work your way in. Important note: Below when we say “out” referring to how close the storm is, we’re referring to the nearest edge of the storm that’s going to reach you first, and not the eye of the hurricane. Keep this in mind since most weather stations will measure from the eye of the hurricane. It’s up to you to know the difference. Make sure you performed all the structural enhancements you could for your home. First aid and CPR classes are great classes for the family to take. Checking the originals and copies, and updating all family documentation should be a quarterly task. This is about as long a warning as we’d have that a hurricane was heading toward any particular region. Look at the structural integrity of your home and make sure you have all the shutter material and hardware you’ll need already on hand. If you have a gas-powered generator make sure it works. If it needs repairs you’ll want to know now. This is about the last day you want to be out and about running errands or buying supplies. Make sure your pantry is full as you’d like it to be. Get longer shelf-life items like canned goods and have ways to cook such as charcoal, gas for your grill, etc. Make sure you have a good supply of non-perishable “comfort foods” on hand. Include treats for your pets. Check your stock of all medications, both prescription and over-the-counter. Include your pets here too. Gas up all your vehicles and fill a couple of 5-gallon gas cans to keep on hand. At this point the weather forecast is going to be pretty accurate as to whether or not your vicinity will feel the effects of a hurricane. Fill some empty milk jugs or plastic soda bottles with water and put them in the freezer (as many as you can fit). Let them freeze solid. If the power goes out, these will help keep your fridge and freezer cold longer. Secure your more important household items such as backup computer disks, paperwork, heirlooms, etc. by putting them in plastic tubs. Start doing some safety landscaping by removing dangerous tree limbs, loose yard furniture, and so forth. Put your storm shutters in place if you haven’t already. At this point, you’ll probably know whether or not the storm is going to be a direct hit for your area. Take last minute photos of property and family members. Recharge all your electronics (cell phone, laptop, etc.) while you still have power. Turn your fridge and freezer down to their lowest setting to keep food colder longer should you lose power. If your home might flood move your cars to higher ground and move your more valuable furniture and possessions off the floor. If flooding is not an issue, park your car in the garage or other protected area. Brace your garage doors so they don’t cave in during high winds. Make sure the kids are home. Again, please remember that when we say “so and so hours out” we’re referring to the leading edge of the storm that will hit you first, and not the eye of the storm. Bring the kids in the house and have them help you with last minute stuff. Bring in all outdoor pets. If they can fit in the house they should be brought inside the house. Start building a “nest” in the room that’s the safest area of the house. Put down a mattress (possibly with a heavy table over it as protective cover), have some snacks and water handy, make sure you have a radio and flashlights all with extra batteries. Also, be sure to have your pet carriers there for smaller animals. This keeps them protected and easier to move if needed. Start filling your extra water containers (bathtub, etc.) in anticipation of a loss of water. If you can secure them (so they don’t blow away), your outside trashcans can be used as rain barrels. If the kids have bike or skateboard helmets have them put them on. Unplug all the electronics you were charging and unplug any valuable electronics like your television, stereo, desktop computer, etc. to protect them against surge from lightning strike (and stay off corded phones). Close but don’t lock all your interior doors to limit flying debris or wind flow should a window break. Move to the “nest” you made in your safe area and stay put until the storm is over.